In today’s times, when both parents are working, our little ones often have to spend some time alone at home. That is not a bad thing, though. Older children should be allowed to spend a little time alone at home. It teaches them some amount of independence and makes them not fear the idea of being alone. That said, ensuring children’s safety while they are alone at home is a major parental responsibility. The next step would be to analyze your housing arrangement. Independent houses are a strict no-no for kids to be left alone. Apartment complexes are safer and hence more suitable for a kid be alone in. If your building is using the ADDA app, safety is pretty much at a higher level. Even more, if your apartment is using the ADDA Gatekeeper. 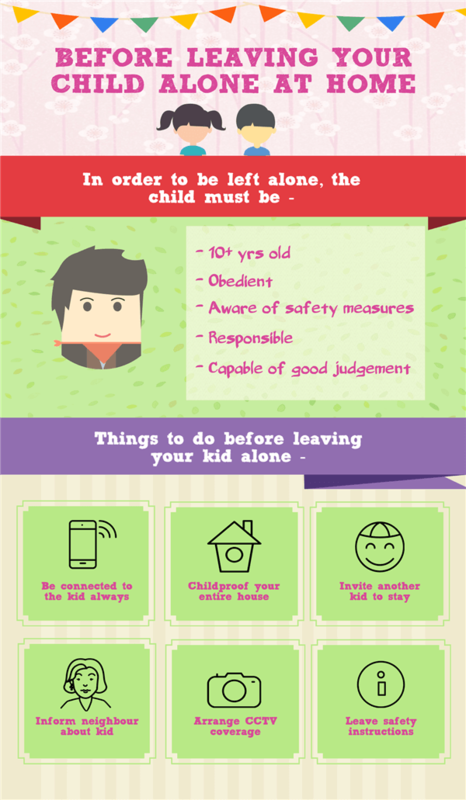 So, assuming that the child is developed enough to take care of himself and that the apartment is safe, here are the list of things you must adhere to while leaving a 10+ year old alone at home. Landlines or mobiles are must haves for a kid who is alone at home. Should an emergency occur, the kid should have the equipment to contact parents or guardians. Not that it is necessary with kids these days, but they should be capable of making calls or contacting emergency services if it comes down to it. Thankfully, kids these days are pretty tech-savvy, they can easily navigate around on the internet and send/receive pics on WhatsApp and other social media. Making a phone call would be a cakewalk for them. Ideally, sit with your child and give him a list of things he’s allowed to do and a list of places he’s allowed to be. There’s no guarantee that they’ll stick to it because they are kids and they might have a tendency to explore. But it is best to keep the informed about the dangers that various things around the apartment pose. Let a friendly neighbor know that your kid is alone at home and will be alone for x no. of hours. Politely ask them to check on them once in awhile and request them to help out in case the kid needs something. This is essential because adventurous kids wander off to meet their friends and they may be less than careful to lock the doors behind them. Or they may step out accidentally and lock themselves out. Having an adult dropping by occasionally will at least ensure that anything amiss will be caught early on. This is not a doable option for everyone, but it would be great to have a recording one at least if not a broadcasting one. In the event that something terrible did happen, a footage may help shed some light on what went wrong. It is always best to have company. If you have more than one child, leaving the two alone at home could turn your house upside down but that is better than one child all by himself. Make sure that both kids know basic first aid steps and that they have enough understanding of personal safety. Do not interact with strangers who ring the bell. Even better, do not open if you see through the viewing hole that there’s a stranger outside. Here having a grill door outside your main door helps. The child can be instructed to only open the main door and never open the grill door for any unknown person. You can also assign a safe house/safe spot for the kid to run to in case he/she feels unsafe. We understand that it is difficult to manage children while having busy careers. But your responsibility to your child is endless. Even with the most intelligent and responsible kids, things could go wrong. In some cases, a simple fall can cause fatal damage if medical attention is not provided within minutes. Let that sink in. If your job requires you to leave your kid alone and often, think of an alternative. Shell out some cash and arrange a nanny or get your ward admitted to some day-care/ skill development classes. Leaving children alone frequently and for long has a not so favorable impact on their minds and it could not be good for them. Let them learn music, or art or something they are interested in. We understand the predicament you are in and we know that you are doing your best as a parent. We’re sure you’ll find a way to balance everything. And if you have some insights or ideas on this topic, do share them with us so that others could benefit from it. Good luck!